My Fair Princess by Vanessa Kelly is the first book in her new series, The Improper Princesses. I got attracted towards it because of the blurb which promised lots of scandal, a spunky heroine and a Darcy like hero. This is the story of Gillian who is the illegitimate daughter of a prince. Raised in Italy, far away from England, she is adept in wielding a gun but is completely ignorant of the rules of society. When she is ordered to England to find a suitable husband, Charles Valentine Penley, the excessively proper, distractingly handsome Duke of Leverton, is given the task of mentoring her to become a lady and leave her tomboy manners behind. But what Charles doesn't count on is his unwanted attraction towards this improper princess! I enjoyed meeting Gillian who is bold, feisty and a heroine unlike the conventional heroines we meet in historical romance stories. Charles is somewhat like Mr. Darcy, remote, strict and exceedingly proper. He can make and break a person's image. The attraction between Gillian and Charles is developed in a most delicious manner by the author and I enjoyed every second spent reading the book. The story is fast paced and full of engrossing events that held me captive throughout. I enjoyed meeting Gillian's family especially her half brother and am eager to read his story which promises to be a scandalous one! The narration is fluid and the world building spot on. I could visualize Gillian's past and present homes in vivid detail quite easily. 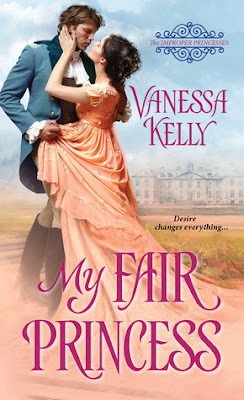 All in all, My Fair Princess by Vanessa Kelly is a lovely and entertaining historical romance that is suited for a lazy afternoon. 4 out of 5 to it and recommended to all historical romance lovers.